Streets paved with cobblestones, long shadows stretching from glowing lanterns, the wind playing with the colored leaves and the dark outlines of the Gothic cathedrals. This is magical Prague, a city shrouded in countless myths and legends from its thousand years of history. Set out on the trail of its mythical inhabitants and creatures to unusual places, which go to make up the unique character of this city on the banks of the Vltava. 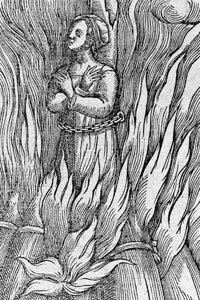 Libuše was a legendary woman who ruled the Czech people back in the day. She had quite a unique ruling style, basing a lot of decisions on prophecies. For example, when she was pressured into marriage, she didn’t select any old prince. And she could hardly consult the personals. Instead, she insisted on marrying a man in her vision. He was a ploughman, named Přemysl, who would be found in the fields near the village Stadice. Now, that is picky. Her decision to found Prague was based on the same mystical approach. 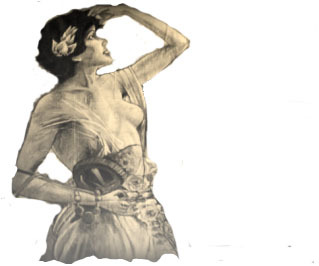 Libuše had a vision a city “whose fame would reach to the stars.” She said the place would be near the river Vltava about 30 hons (4.5 kms) from where they were. Having trusted her method of selecting a husband, the people went to where she said and found a man making a threshold for a house. Threshold in Czech is práh, hence Praha. The site is what we now know as Vyšehrad. When the Czech lands were ruled by prince Křesomysl, a farmer named Horymír lived in the village of Neumětely. He had a white horse of extraordinary intelligence called Šemík. Due to Křesomysl’s obsession to find treasures that were said to be hidden underground, people were encouraged to abandon farming and to become miners. Horymír was unhappy with Křesomysl’s rule and warned that neglecting farming would result in famine. His protests were not liked by the miners who one day set Horymír’s property on fire. Horymír and his followers in turn burned down the miners’ village. Horymír was punished and sentenced for execution. When he was asked his last wish, he requested one last ride around the castle grounds on his beloved horse Šemík. His wish was granted. When Horymír got on his white horse, he whispered something in his ear. Šemík ran to the ramparts, jumped over them and slid down the cliff. When the on-lookers got to the ramparts, they were astonished to see Horymír and Šemík on the other side of the Vltava River, galloping towards Neumětely. The suburb Smíchov apparen tly derives its name from the word smích, which means ‘laughter’, but the legend is not very cheerful. 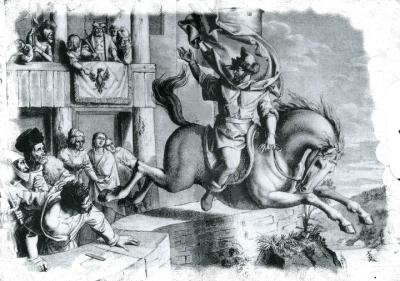 This story is set during the reign of Vojen, the third of the mythical Czech counts. When Vojen came into power, he was too young to rule, so a Rohovic was appointed to govern in his stead. Rohovic was a stern ruler who punished any act, no matter how small. Eventually, the people decided they would prefer a young ruler than this guy. The upstart tried to stop the rightful ruler getting into the castle and escaped when they finally did. Rohovic now turned to a life of crime, preying on the people in the Lucko region. Vojen sent a messenger to order Rohovic back, and Rohovic sent him the messenger’s head on a stake. Now things were serious. After 63 day seige of Rohovic’s stronghold, Vojen’s men captured Rohovic and brought him to Vyšehrad. Vojen wasn’t in the mood for mercy and sentenced Rohovic to death on the riverbank opposite the castle. While in the boat, Rohovic, who didn’t know when to quit, cursed and threatened Vojen. Now, if you’re thinking that Rohovic, escaped and got the last laugh, hence the name, sorry you’re mistaken. The villain finally got his comeuppance. As for the laughter, it was due to the evil spirits, which gathered around his body as he was executed. When you are walking through the romantic park on Petřín, you probably won’t believe that a once stood here, on which pagan priests burned beautiful young virgins in sacrifice to the pagan gods. During the reign of Prince Boleslav, the altar was destroyed and the Church of St. Lawrence, which still stands today, built there. Legend tells us to this very day that the pagan gods appear here in the form of mysterious fires. But you needn’t worry, these fires allegedly have magical power and are even able to cure rheumatism!?! Now, we ju mp ahead to the time of Václav IV and the court magician Žito. One day, Žito turned thirty sheaves of straw into thirty large well-fed pigs, as you do when you’re a magician. A wealthy baker called Míchal bought the pigs, but Žito warned him never to let the pigs touch water. Míchal clearly thought this rule absurd. Pigs love mud. Mud contains water ergo he could safely take them across a stream, couldn’t he? No sooner had the pigs put their trotters in the water they turned into straw again. The baker was so furious he went to look for Žito, finally finding the magician napping in a pub. He tried to wake the slumbering wizard by grabbing his leg. In his fury he tore it from Žito’s joint. Žito awoke and was now himself in a rage. He clutched the baker around the neck and together they went to the court, where the people could see the injury. 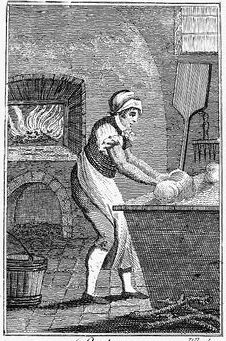 All the baker could do was beg for forgiveness and pay compensation, even though it was him who was sold faulty pigs. From this time, derives the saying “You have profited like Michael on his pigs,” meaning you haven’t benefited at all. A further moral could be that when dealing with people in government, which Žito belonged to at the time, it will always cost you. In the 16th century, during the reign of Rudolf II, an old Jewish man named Rabbi Judah Loew lived in Prague. During that time, the Jewish people of Prague were being attacked and lived their lives in fear. 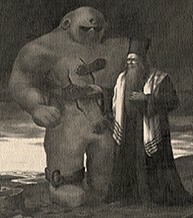 Rabbi Loew decided to protect the Jews against pogroms by creating the Golem, a giant who according to the Cabala could be made of clay from the banks of the Vltava. Following the prescribed rituals, the Rabbi built the Golem and made him come to life by reciting a special incantation in Hebrew. The word “emet”, meaning “truth”, was placed on the Golem’s forehead. The Golem would obey the Rabbi’s every order and would help and protect the people of the Jewish Ghetto. However, as he grew bigger, he also became more violent and started killing people and spreading fear. Rabbi Loew was promised that the violence against the Jews would stop if the Golem was destroyed. The Rabbi agreed. By removing the first letter from the word “emet”, thus changing it to “met” (meaning “death”), life was taken out of the Golem. According to legend, the Golem was brought back to life by Rabbi Loew’s son, and may still be protecting Prague today. 7) WHY CZECHS ARE CALLED CZECHS AND NOT ANYTHING ELSE? There were three brothers named Czech, Lech and Rus. One day, they decided to find for their tribes and themselves a new place to live, and so they all set out for a long journey across the Europe. After some days had passed, the brother Rus suddenly said. „This is the new home for me and my tribe!“ and so they stayed and founded Russia. The two brothers and their tribes walked for many days, when they climbed up a hill that is now called Rip (Říp). There they had a wonderful view of the land that the forefather Czech called the „land of milk and honey“, and decided to settle here with his tribe. To honor this great man, the people of his tribe started to call themselves Czechs. And they still do now. And brother Lech? He continued his journey with his people and settled in present-day Poland. The Rip Hill is about 50 km north of Prague and you can see it from the Petrin tower at Petrin Hill. Here, you get to see not only Rip Hill but also the entire city and it’s surroundings. Located in the magnificent Prague Castle complex is the Daliborka Tower (part of the castle’s late Gothic fortifications), one of Prague’s most famous sites concerning myths and ghosts. Daliborka Tower was originally used as a prison until the end of the 18th century. Initially the prison was designed to hold only noble prisoners but towards the end it became a prison for commoners as well. The tower is named after its first prisoner, a man called Dalibor from the village of Kozojedy. Dalibor, a young and brave knight was sentenced to death and kept in the dungeon of the tower for the crime of sheltering naughty serfs in his home making him in a sense, a sort of Robin Hood. 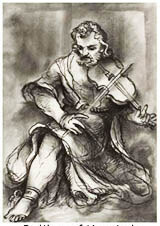 According to legend, Dalibor learned how to play the violin while imprisoned in the dark tower. The dulcet sounds of the violin would drift through the air and awake touching sympathy in the citizens of Prague who would in turn gather by the tower to listen to Dalibor play and give him food and drink. Dalibor was so popular that his execution date was never announced. The citizens merely knew that Dalibor was no longer once the sweet notes of the violin ceased. Visit Prague Castle in the evening to capture a truly creepy feeling! A legend says that a wealthy man called Myslík was forced to run away from Prague after the battle of the White Mountain. He gathered all his precious silver and melted it in a fish-shaped clay mold. 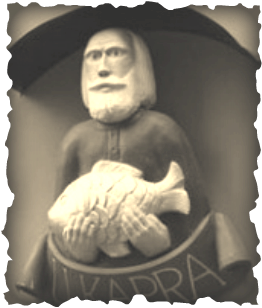 Before leaving his beloved Prague, Myslík hid the silver fish inside a wall of his house. Many years later a new tenant was living in that house. One day, this man was ordered by the city counselors to tear down the old building and build a new one. The poor man fell into despair at the news as he didn’t have the money to do that. He was about to leave his house when Myslík’s silver fish fell out of a broken wall. The precious object allowed the man to restore his old house. This legend is still well known in Prague and the moral of this story is that someone’s misfortune may always turn into someone else’s good luck and so we should never lose our hope. Neomenia, Bruncvik’s wife, was was worried about Bruncvik – she begged him not to leave Prague for his adventures to the unknown lands. But Bruncvik decided to leave and gave her his wife a ring to wear, and took hers, and promised he would return in 7 years’ time. He told her that she would recognize him by her ring, and that if he didn’t return in time it meant that he was dead, and that she should remarry. Bruncvik set out on his adventures accompanied by 50 men on horseback. They travelled far and wide, soon they’ve reached the sea (supposedly Adriatic sea) and took to the sea in a large boat. After several uneventful months, a storm whipped up and bathed them in a yellow glow. It was the dreaded Amber Isle, which sucked sailors to its shores. After two years on the island, all of the men and horses were dead except for Bruncvik and the oldest man of his former consort. The old man told Bruncvik how to get away, and Bruncvik promised to take care of the old man’s family, should he ever return to Prague. A large carnivorous bird was just about to make his annual trip to the island (a chance to escape the uninhabited island)! The old man sewed Bruncvik into one of the horse skinsand left Bruncvik near the top of the Amber Mountain. The bird carried Bruncvik away to its nest, as food for its babies, and flew away. 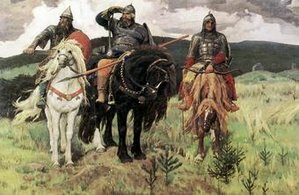 Bruncvik drew his sword and made short work of the rest of his horse skins disguise and escaped. He travelled far and soon arrived in a deep, wild forest, where he spotted a lion, fighting a nine-headed monster. Bruncvik battled with the lion against the monster for 2 days. After they’ve killed the monster, chopping off all its heads one by one, they both dropped down with exhaustion. The lion cared for Bruncvik and brought him food, and nursed him back to health. From that time on, the two were inseparable. During his long trip in one of the castles, Bruncvik found a magic sword that knew how to chop people’s heads off all on its own – all Bruncvik had to do is say “Blade, heads off!” and off they rolled. Bruncvik and his lion had many adventures together in strange lands, inhabited by demons. Some of them were half grey and half white, some had a dog head instead of a human head, and their king had eyes in the back of his head as well as the front. But none of these heads stayed attached to their necks for long after Bruncvik’s arrival. After 3 more years of long trips to weird lands, Bruncvik came home, he was surprised to see everyone celebrating the wedding of Neomenia (the Queen). It had, after all, been longer than 7 years. Bruncvik snuck his wife’s ring – which he had worn all the time – into his wife’s goblet of wine, and left the castle. When his wife drank her wine saw the ring, she recognized it immediately. She called the wedding off, thus sending her ex-bridegroom into a mad fury. He and 50 of his friends set off to track Bruncvik down and kill him. Soon, the 51 heads of all of his rivals were rolling on the ground, chopped off by that magic sword, and Bruncvik was in his beloved Neomenia’s arms again. Bruncvik never left home again, and his pet lion never left his side. When Bruncvik died at a ripe old age, the lion died of a broken heart just days after, sitting at the side of Bruncvik’s grave. Bruncvik’s lion is said to be the two-tailed lion in the Czech state symbol. 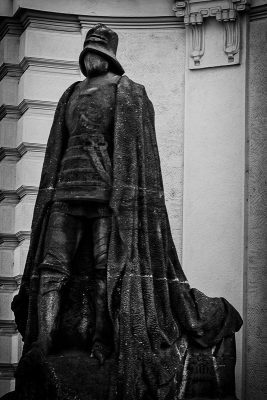 As the Knights of Blanik are entrusted with the same task, many have drawn the conclusion that St Wenceslas – with Bruncvik’s sword – will lead the Knights of Blanik when that dark hour comes. 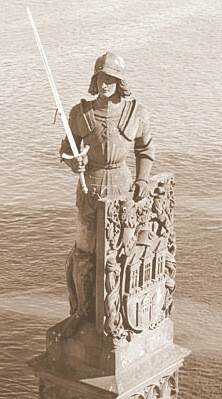 Today the sword’s hiding place is inside the stones of the Charles Bridge next to the statue of Bruncvik that stands below the bridge (and the dragon that Bruncvik killed below the other bridge)– and one day, when the Czech lands are at their lowest point, at the very edge of ruin, St Wenceslas will rise from the dead, take Bruncvik’s sword, and save the nation. If you so happen to be wandering about the environs of St. Agnes Convent in Josefov during the dark hours of a magical evening be sure to watch out for the Murdered Nun! She appears to be quite moody, one evening she might be covered in blood and weeping bitterly and other evenings one may find her smiling tenderly at unhappy lovers. The child of a wealthy nobleman, this child tragically fell in love outside of her class with a poor knight. 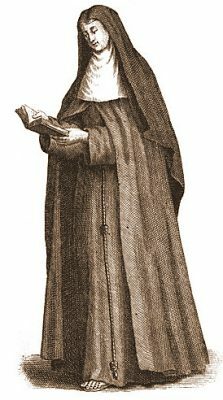 Her noble father of course refused to give his consent for marriage and as her payment for her unforgivable sin she was to be sent to live in St. Agnes convent, where she still resides today but only in transparent form. The night before her transfer to the convent she decided to follow her heart and met with her beloved but was, alas also met by her father who in an outrage stabbed her for shaming him. The Murdered Nun has been haunting the area of St. Agnes ever since but do not fret, for the Murdered Nun is not to be feared! It is known that the ghost once appeared to a girl who wished to poison herself because of an unhappy and poor love affair. The Murdered Nun grabbed the poison from the depressed girl’s hand and placed a bag of coins in it instead, enabling her to live a happy and prosperous life with her true love. If Prague only had more ghosts like the Murdered Nun! If you so happen to wander into the Church of St. James in the center of Prague’s Old Town, make sure to look up and to the right when you enter the holy church. You will find yourself staring at a petrified arm bone. 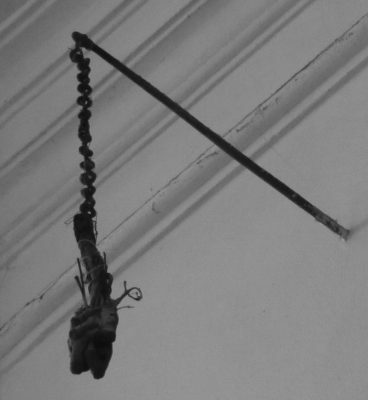 The arm bone in question once belonged to the aptly named One Armed Thief, a man who purposely hid inside the church and waited until the verger locked the doors. After he was safely locked in he proceeded to steal the jewels, gold and precious items in front of the church’s statue of the Virgin Mary until the statue grasped the thief’s hand. In the morning the man was found with his hand cut off. What happened to the One-Armed Thief? Did the statue come to life or did he imagine it because of his horrible sins? One thing is for sure, his arm is hanging in the church’s interior and his ghost haunts the entrance. The One-Armed Thief will try to establish contact with you if you take notice of him; make sure to listen to his story while he shows you his stump arm! In the Old Town district of Prague you will find a monument to the Iron Man. The Iron Man is a true ghost of Prague and one of the only ghosts in the world to have a monument built for him! The name of the Iron Man in question is Jáchym Berka, a man in ghost form that has been waiting for his freedom from his ghostly servitude for over four hundred years! The story goes a little something like this: Jáchym Berka was engaged to be married to his sweetheart when he left to defend his country. Upon his return he heard evil rumors regarding his betrothed’s fidelity and without an explanation he married a different girl from his neighborhood. Jáchym Berka’s former finace was so heartbroken, rejected and unwanted that she drowned herself in the Vltava River and her father was so ashamed that he flung himself from a high tower. After hearing this horrible news, Jáchym Berka realized what he had done and promptly strangled his drunk wife and hung himself in his cellar on Good Friday. His death was not a peaceful one and he has continuously wandered Platnéřská Street simply waiting for his freedom. Freedom however does not come at an easy cost and Jáchym Berka gets only one chance every one hundred years. In order to be freed, he must find a pure virgin girl and have a friendly chat with her for one hour, a task that seems so very simple, yet not many good girls wish to chat with a ghostly murderer, nor are there many virgins still around! Sadly enough the Iron Man lost his chance once again in 2009, now he must wait another hundred years.